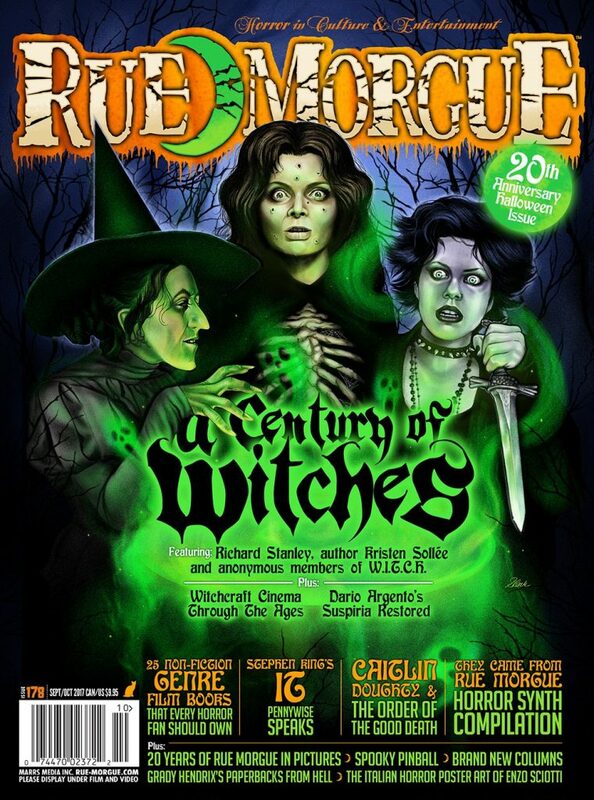 Halloween is coming early this year with Rue Morgue’s 20th Anniversary Halloween Special Issue #178 Sep/Oct 2017, featuring legendary filmmaker RICHARD STANLEY, author KRISTEN SOLLEE and anonymous members of W.I.T.C.H. for a roundtable discussion celebrating a century of witches. Also features: Witchcraft cinema through the ages, Argento’s SUSPIRIA restored, original cover art by SARA DECK and more! Plus! 25 NON-FICTION HORROR FILM BOOKS that every horror fan should own; a discussion with Pennywise the Clown and the faces behind The Loser’s Club from Stephen King’s IT remake; mortician CAITLIN DOUGHTY and THE ORDER OF THE GOOD DEATH; 20 YEARS OF RUE MORGUE in pictures; SPOOKY PINBALL; Bowen digs up FROM HELL IT CAME; the humanity of THE MANSTER; Thom Burgess and Barney Bodoano’s THE EYRIE; PAPERBACKS FROM HELL; the ITALIAN HORROR POSTER ART of ENZO SCIOTTI; THE HILARIOUS HOUSE OF FRIGHTENSTEIN on vinyl; HELLO NEIGHBOUR and lots more! Plus! Celebrate our 20th birthday with us with THEY CAME FROM RUE MORGUE, our 20th anniversary downloadable horror synth compilation compiled by Aaron Von Lupton! Also features brand new columns from THE HOMICIDAL HOMEMAKER, FILES FROM THE BLACK MUSEUM, VS and more! ON STANDS September 1! See full contents! Cut down on waiting time and shipping costs! Try RUE MORGUE DIGITAL available NOW for iPhone, iPad, iPod Touch, Android, PC and Mac for only $4.99 an issue! Hi Timothy please e-mail your question to info@rue-morgue.com and we’ll look into it for you right away. Thanks! Is this available to download yet on the tablet. I was on my tablet the other night and it was not listed.